I'm very excited about this giveaway! 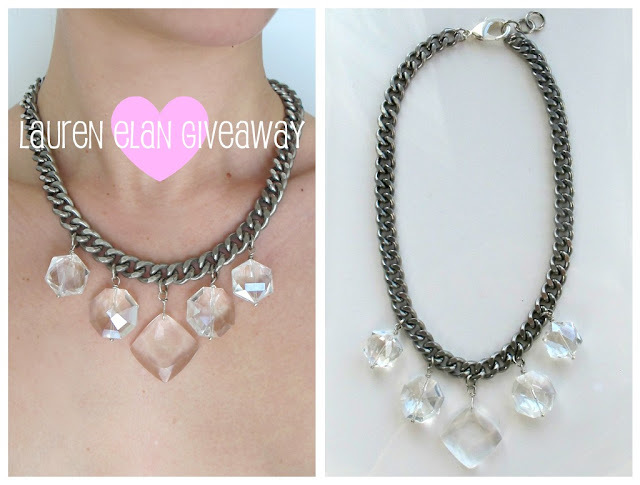 Lauren Elan Collections is offering one lucky reader the chance to win "The Jacob" --an amazing necklace from her collection! I love this piece--it's perfect for layering but also makes a gorgeous statement alone. I'm obsessed with everything in Lauren's store. Currently, I have my eye on "Andy", "Capri Cuff", "Misel" in every neon color, Elyse, and "Abbey" which I've already worn here and here. This contest will run till next Tuesday at midnight Pacific Time. BTW, this is the fabulous designer Lauren in Paris. Isn't she gorgeous?! And she is such a Glitter Girl!! Congrats to Sasha from Everything Fab! We picked you as the winner! fingers double crossed this time! and what a beautiful picture! its a pity european entries are not allowed: i think the piece is wonderful! Camille and Sian are def FOR ME. I like Lauren Elan On facebook! It's so hard to pick a favorite piece they're all so beautiful but I really love the Bethany! I love the Hadley necklace! love this giveaway! i am in love with the Adelaide piece!! ah! The lock necklace is lovely. I love the Annabelle, the Aurora, and the Capri Cuff! And I like Lauren Elan Collections on facebook. Wow, this is exactly my taste! Bold & unique necklaces are my favorite. I'm love with Adelaide, Larisa, and Nina. I "Liked" Lauren Elan Collections on Facebook also! I really love the Maya and the Abbey! All the jewelry is so beautiful!! She has such amazing pieces! I LOVE the Elyse and the Misel (in neon pink)! I liked Lauren Élan Collections on FB too! Wow. I love her pieces. I'm drawn to the city collection most of all. The Adelaide necklace is my favorite. It's so versatile. Thanks for the chance to win. xo. Oh wow, her line is amazing! Thanks for sharing! Easy-the capri cuff- all the way! I love her stuff and I liked her on facebook! I happened upon Lauren Elan a few weeks ago and featured her jewelry on my blog. Absolutely adore Lauren's statement pieces. Love this Jacob necklace, but also fell for the Abbey in the bridal collection. Lauren is as talented as she is sweet. I love the Angeline necklace. It's SO dramatic and it's purple. So fabulous. p.s. I already like Lauren Elan on facebook. Awesome giveaway, here stuff is so beautiful! I love the adelade! so pretty!!! And liked on FB! Great giveaway!! I like the Anna bracelet. I love the Abbey necklace, is it still available? Everything's gorgeous, but the Hillary is especially beautiful! love the Danae! Thanks for the great giveaway! This necklace is so beautiful and there are so many more on the website that I love as well! It's nearly impossible to pick a favorite, as I'm kind of in love with EVERYTHING in the city collection, but my top picks are the Jacob necklace, the Corinne necklace, the Abbey Necklace (of course) and the Danni bracelet. Thanks for doing such great giveaways! And P.S. -- Your new tumblr page looks gorgeous! The Elyse! I love it I love it I love it! Well, I lvoe the entire collection BUT especially that one! The Carter bracelet is lovely. Actually, it all is. I'm loving the Hillary necklace. Also liked her on Facebook. Thank you for this wonderful giveaway! I love Hadley! Bold and fun! I heart The Annabelle. So delicate and pretty! I have two faves...the Justyna and the Adair! Super cute!! I know it's ridiculous but the necklace for the giveaway is by far my favorite! "The Jacob"
I'd wear the Laura or the Abby! I love your blog, I live up in San Francisco. I lived in Santa Cruz for a year and a half over near the Costco on Encinal Street :). These are lovely! I really like the Danae lights necklace. I love the Party Collection, especially the Elyse and the Maya! SO fabulous!! I can't pick just ONE! I LOVE the Elyse, the Abbey, Danae, and the Adelaide! Oh my goodness. Love Adair, Adelaide, Lina and Krista. Everything is so stunning yet totally wearable! I love all the chunky "City" pieces! The Adelaide and Caitlyn are my favs. The pieces are stunning! Her jewellery is sooo pretty! I would really like to participate. I love the Capri cuff! Love the entire City colletion, especially the Adelaide necklace and the Andy bracelet! I love, love, love the Daria and Aline necklaces! Lauren is such a talented designer with great vision! The Capri cuff and the Jacob are my favorite! Beautiful stuff!! LOVE the Jo and Abbey!! So fun! I'm all about the Jo and the Nina. So gorgeous, all of it! my faves are the capri cuff and the aria necklace. so great! My favourite Lauren Elan piece is Abbey. I love the way you wear it, Taylor. I'm also loving the Misel bracelets for spring! The Adelaide is totally gorgeous. I love the industrial mixed with fem vibe. It could literally go with anything in my closet for the Summer. Loving that mixed medal necklace that is the prof pic sooo much! I also love the giveaway necklace!! I love the Krista Necklace from the romance collection! So cute! Hope I'm not to late!!! Luv it! And I liked her on FB! What a gorgeous collection! The Misel Friendship Bracelets are particularly adorable. I also really like Abbey (from the bridal collection). I liked her on FB, too. Yay! i like her on facebook! !